With industry investment in US digital advertising reaching $107.30 billion in 2018, (an 18.7% increase from $90.39 billion in 2017), do promotional products have a place in your marketing mix? If you factor in the cost per impression (CPI) or cost per thousand impressions (CPM), there’s no doubt that promotional products cost less and will outlast any digital marketing efforts. The longer recipients keep promotional products, the more impressions it makes on them and anyone else exposed to recipients using these products. Let’s face it. A social media post, web page, or banner ad leave fleeting brand impressions, whereas most recipients keep a promotional product between one and five years! 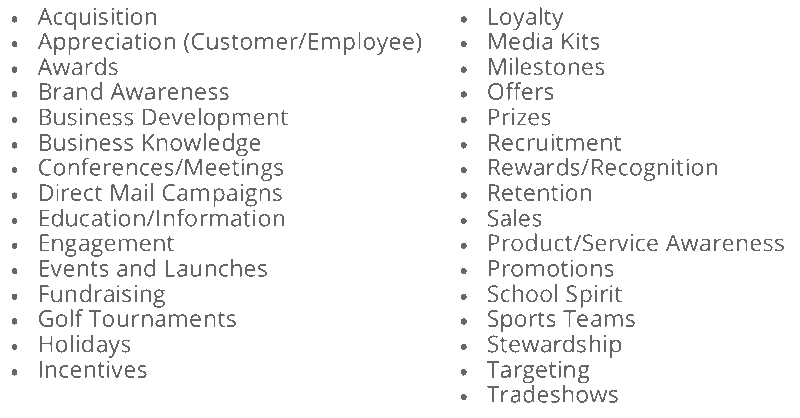 Promotional products have the highest advertising reach above any other form of advertising providing exposure each day. In fact, five out of 10 consumers stated they encounter promotional products most of the time or at all times per day. 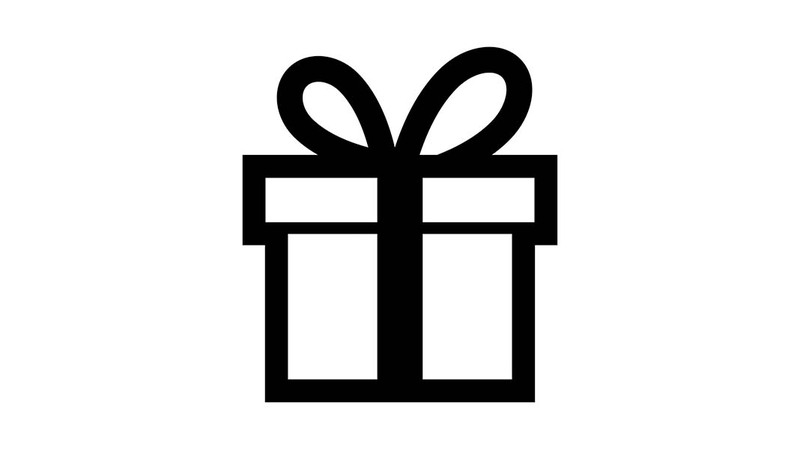 Nearly nine in 10 recipients can remember the branding and eight in 10 can recall messaging from at least one promotional product they received. Eight in 10 consumers revealed that their impression of a brand positively changed directly as a result of receiving a promotional product from that brand. Roughly eight in 10 admit to looking up the brand after receiving a promotional product, and 83% said they are more likely to do business with brands they’ve received promotional products from than brands they have not received promotional products from. 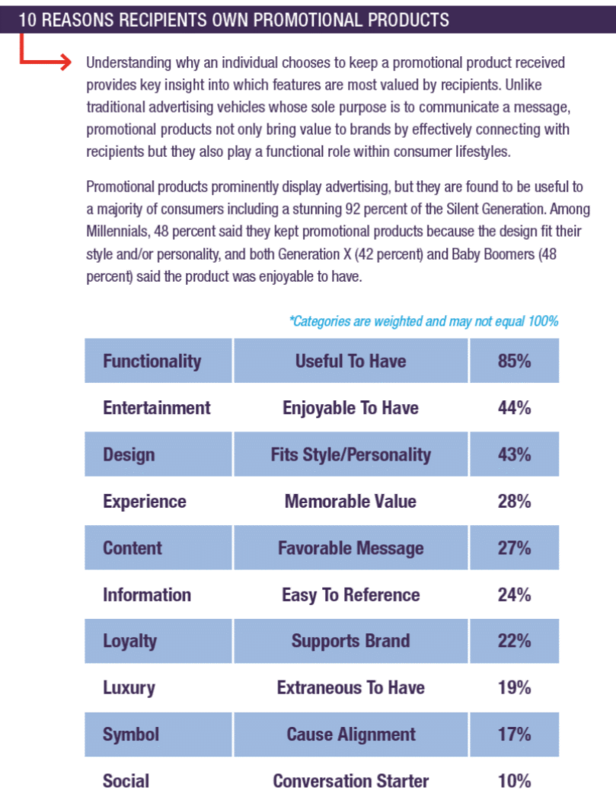 When asked to rate which advertising channels provide consumers with an incentive to take action, all generations regarded promotional products as most effective. 87% of buyers credit promotional products with contributing to success in reaching their marketing goals. 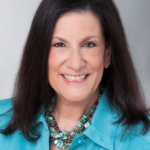 96% of buyers believe promotional products are an effective form of advertising, with 36 percent indicating extreme effectiveness, 48% moderately effective and 12% slightly effective. Emotions are at the heart of the relationship between brands and consumers, subconsciously steering buying behavior. 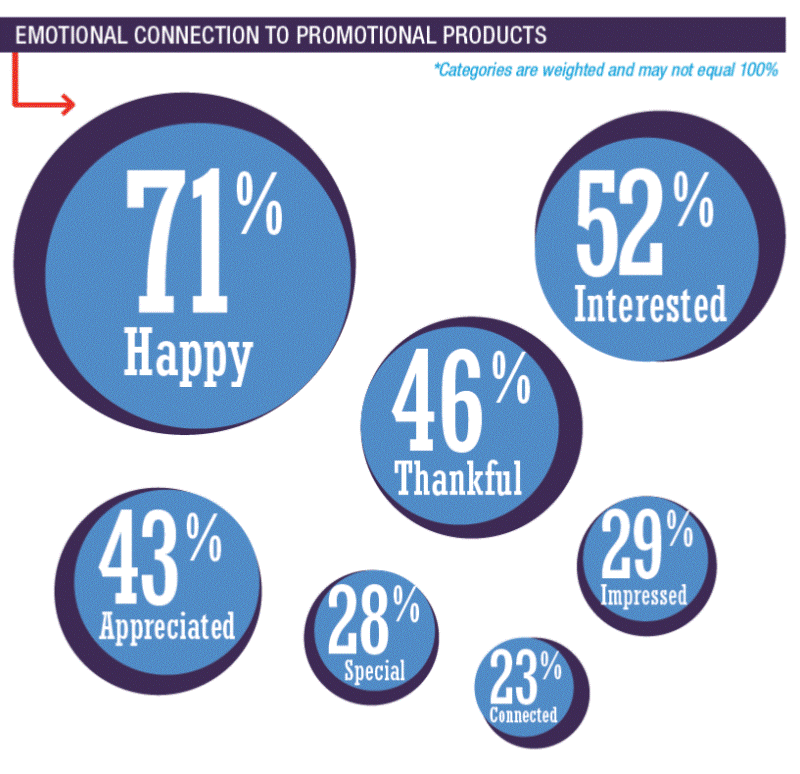 Promotional products resonate with consumers, driving consumers back to the brand. How do businesses and organizations use promotional products? 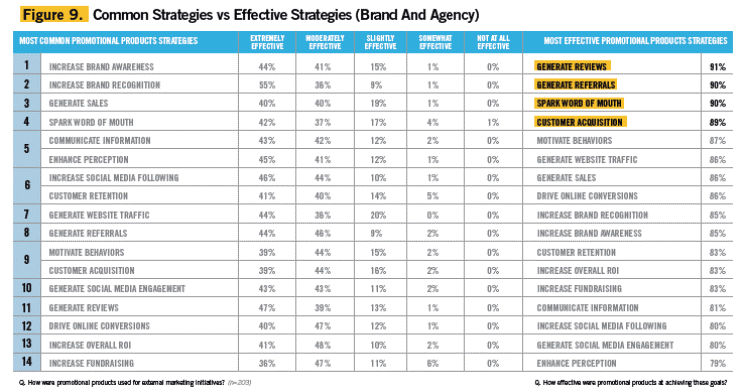 The number one strategy: increase brand awareness! Which promotional products should you consider? 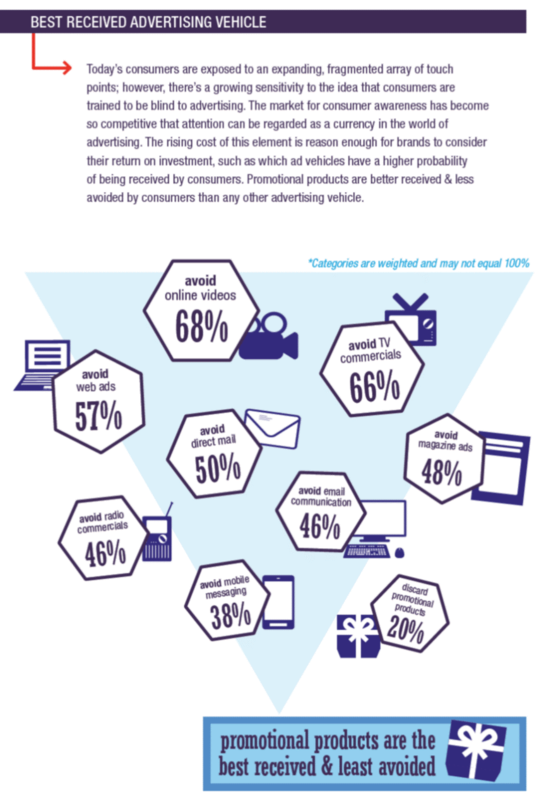 Get this: half of all US consumers own a promotional bag!! With increasing municipal environmental legislation and retail outlets eliminating plastic bags, reusable promotional bags are more popular than ever. They’re great for carrying groceries, shopping purchases, books, travel, beach stuff, and a lot more. 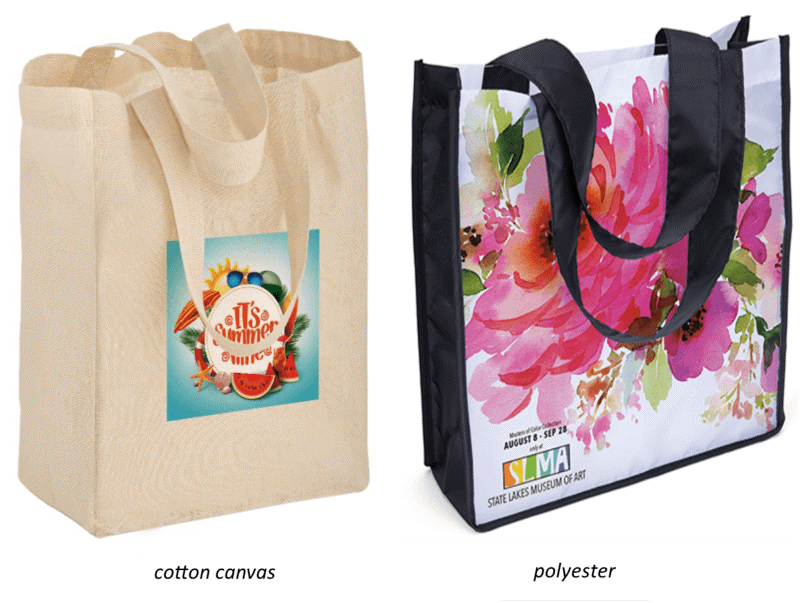 Four-color imprinting technology makes these bags appealing. Although they cost a bit more than standard screen printing, the visual result for your brand is striking. 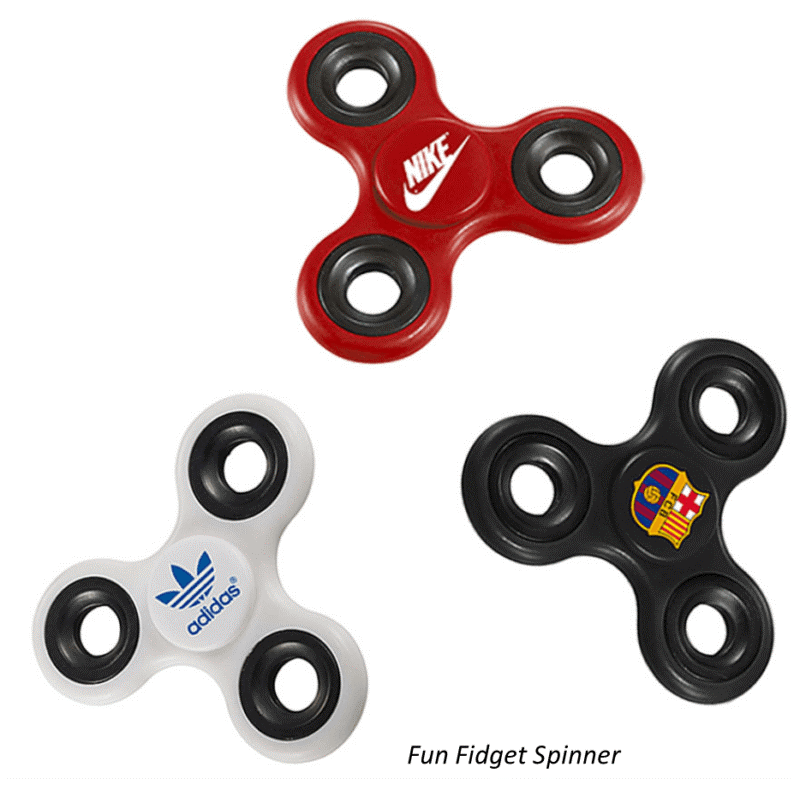 Invented in 1993, the fidget spinner stress reducer re-surged last year and has recently hit the promo product industry. 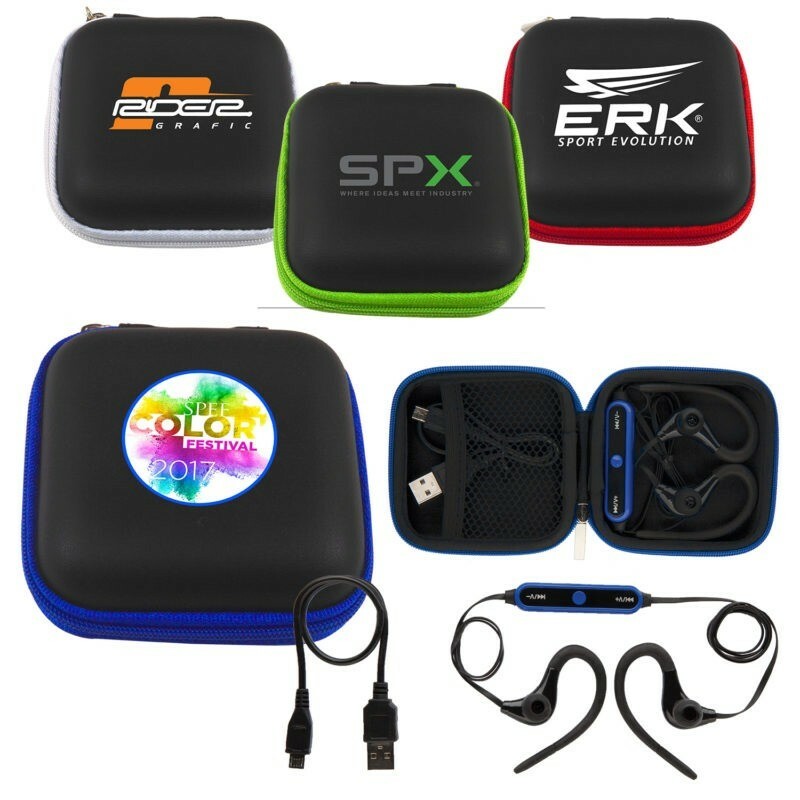 The latest audio trend is Bluetooth® earbuds which enable recipients to listen to music, make calls, or watch videos without being tethered to their phones. There are still the traditional favorites to consider, like USB drives, apparel, drinkware, backpacks, office accessories, headwear, and food. Try to tie products into your marketing campaigns or develop one with a promotional product as the centerpiece. Whether you work for a B2B, B2C, or nonprofit organization, there are so many uses for promotional products in your marketing mix in addition to boosting your brand. You can read more here.